It’s been a fascinating exercise to see who all these people were. The plot was originally purchased by “Mr Rio G M Stapley” of 131 High Street, Deptford, on 12th June 1896 for £3, and the memorial on the grave is described as “Flat stone & Curb set on Landing (Full Memorial)”. I can find no “Rio Stapley” in the censuses, but living at 131 High Street, Deptford, in both 1891 and 1901 is Michael P. Fannen, an Irish-born Roman Catholic priest, along with two other priests and a couple of housekeeping staff. Should “Rio” be “Rev”? It looks like the grave was donated or paid for by the local church, or perhaps a kind parishioner. Honorah Carroll was buried in the same plot on 10th of February 1900, and was 55 years old. The censuses show her to be John Carroll’s wife, and give her birthplace as Co. Kerry, Ireland. In 1901, John Carroll married Mary Jane Wright (previously Freeth, formerly Clarke), my great great grandmother. The third person interred was 41 year old John Carroll, eldest son of John and Honorah, buried on 8th February 1918. He was also born in Deptford, and his occupation in the 1891 census was pupil teacher. 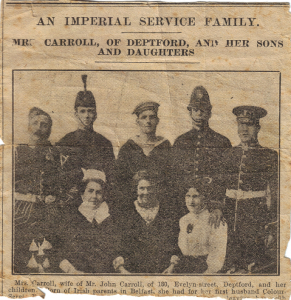 On the 18th of February in 1918, the ownership of the grave transferred to Mr John Carroll of 180 Evelyn Street, Deptford. Johanna Colligan (transcribed as “Colhgan” in the burial register copy) is listed as the fourth internment on 16th of March 1918. She was 44 years of age, and John and Honorah’s eldest child. She married Richard Colligan in 1901, and they appear to have had three children: Honora in 1902, Michael in 1905, and Margaret Mary in 1910. By March 1918, John Carroll had lost his wife and three of their four children. John himself joined them on 26th of January 1923, aged 76 years. The last person to be interred there was Mary Jane at 76 years of age, on 17th of February 1932. On 4th of March 1932, the ownership transferred to Mary Freeth (no address given), Mary Jane’s eldest daughter. Tombstone Tuesday is an ongoing series at GeneaBloggers. 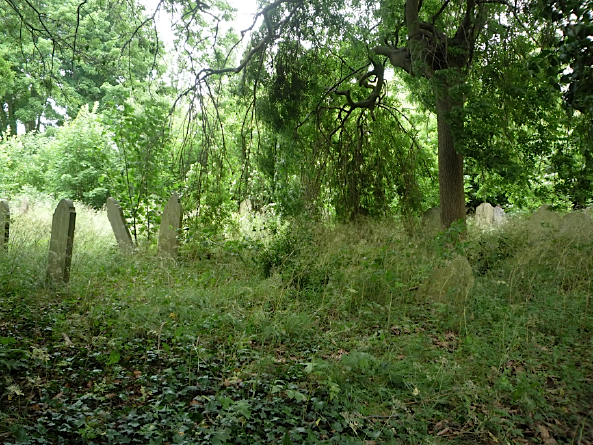 Last week I posted a couple of photos of Brockley Cemetery in Lewisham. This is where my great great grandmother, Mary Jane (Clarke) Freeth/Wright/Carroll, was buried in 1932. I’d found her entry in the Greenwich Union death register and discovered she had been buried “by friends” in Brockley Cemetery1. In May 2012 I contacted Lewisham Council and a lovely staff member there sent me Mary Jane’s burial details, as well as a map marked with the location of her grave. Eureka! You can see how overgrown the area was – it was almost impossible to read any of the gravestones, even where the inscriptions were still legible. After an hour, we gave up the search. My next step is to contact the Friends of Brockley & Ladywell Cemeteries, in the hope that they may be able to pinpoint the grave location more accurately. And to buy some heavy-duty gardening tools. Board of Guardians, Workhouse Woolwich Road (Greenwich Union, London, England), “Register of Deaths”, Mary Carroll death, 12 Feb 1932; digital images; Ancestry.com, London, England, Deaths & Burials 1813-1980 (http://www.ancestry.co.uk : accessed 23 Jun 2011). Here is a copy of Will’s snapshot of me – it is not so good as his is it. How are you getting on? also Hilda I hope she is well – give her my love. Have you seen Rose Godfrey lately? Give her my love. I must write to her soon. 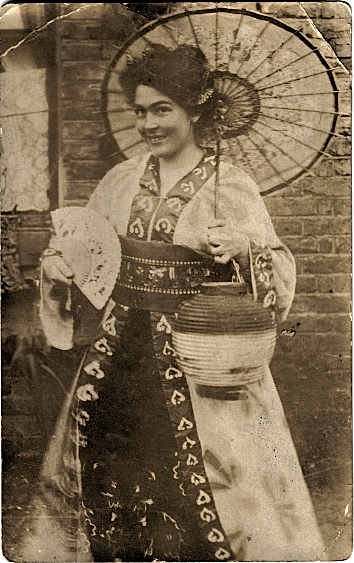 Am very busy just now – with fond love from your big fat Japanese sister Mollie. As far as I know (from family legend), Alexander deserted from the army and somehow turned up in New Zealand. I need to do some digging and find out more about his time with the Fusiliers, and also how he managed to get passage to New Zealand. 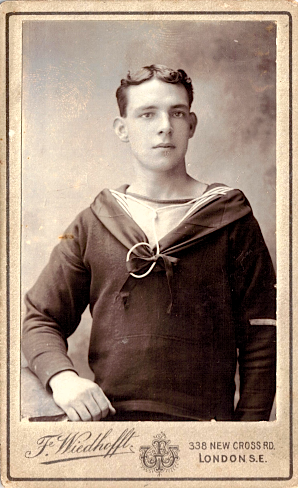 Family members concluded that Alexander had been in the Royal Navy, and had jumped ship. 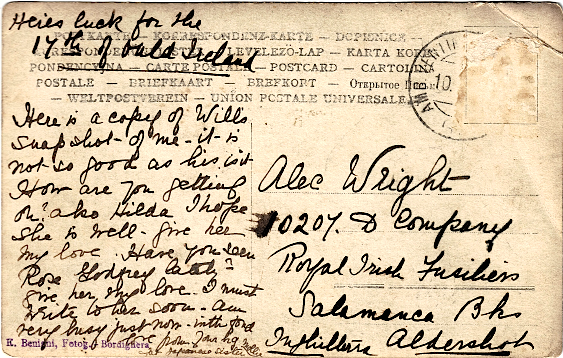 I’ve since identified the mystery sailor as Alexander’s brother, (Ephraim) George Wright, and that it is his handwriting on the back. He obviously wrote on the photograph to whom he was sending it! I’ve been searching for my great great grandmother Mary Jane Clarke‘s first marriage on and off for some time. I’m not sure why I’d never thought to search the Irish Civil Registration Indexes on FamilySearch before now. Possibly because I didn’t know they were there! I’d done a search on Ancestry, which hadn’t brought up anything, and I’d searched on FreeBMD as well, thinking it would have been registered in England. Nada. Mary Jane’s birth was before civil registration started in Ireland, so I was hoping that if I could find the marriage certificate for her first marriage, it might tell me a little bit more about her and her father. 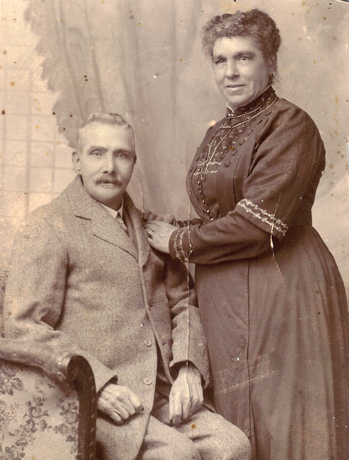 By the time of her second marriage, to my great great grandfather Ephraim Wright in 1882, her father was deceased. So, I had all the information I needed to order a photocopy of the marriage record from the General Register Office’s research facility in Dublin. You can do searches of the indexes there, at a cost. Much handier to do your searching online for free. “1891 England Census, Ephraim Wright (age 30) household, St Paul Deptford, London,” Ancestry.com, (http://www.ancestry.co.uk/, accessed 01 Oct 2010), citing PRO RG12/494, folio 67, p 63, GSU roll: 6095604, Greenwich registration district, St Paul Deptford sub-registration district, ED 2, household 323, 05 Apr 1891. England, birth certificate for Percy Freeth; 31 Aug 1878, Farnham; citing Sep 1878 [quarter] 2a [vol] 111 [page], General Register Office, Stockport. “Ireland, Civil Registration Indexes 1845-1958,” index, FamilySearch (https://www.familysearch.org : accessed 27 May 2011), from General Register Office. Ireland, marriage certificate for James Freeth and Mary Jane Clarke; 05 Feb 1877, Navan, Co Meath; citing No. 25, vol 2, p 960, General Register Office, Ireland. 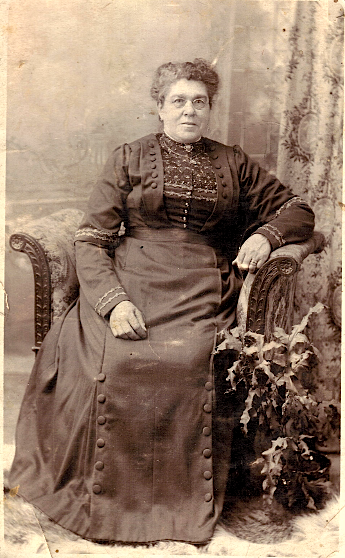 This is my great great grandmother. 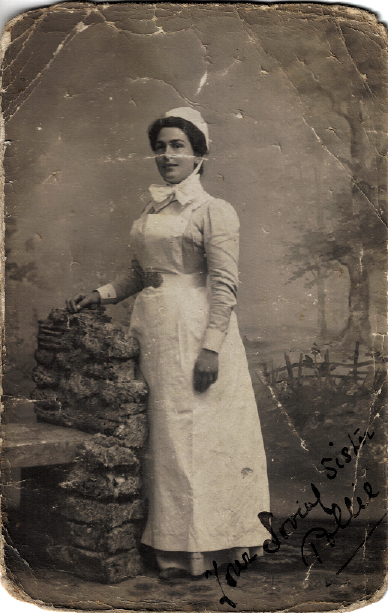 If it hadn’t been for genealogy, I would never have known about this wonderful woman, and my life would be all the poorer for that. This post is in response to a recent article published by LAWeekly. Of all the ancestors I have discovered in my research so far, Mary Jane Carroll (previously Wright, previously Freeth, formerly Clark) is the one whom I’d most like to meet. She comes across as an incredibly strong and loving mother, full of life and spirit. In a recent post I showed a newspaper clipping with her and her children around her. Apart from her eldest daughter Mary1, they were all born in England, but Mary Jane’s strong Irish roots apparently ensured a very Irish household. On November 26th 1894, Ephraim (senior) died of “Enteric Fever”, otherwise known as typhoid.6 He was thirty three years old and left his widow Mary Jane destitute. According to my (first, twice removed) cousin Lally7, the local Catholic priests helped place Lavinia into a girls school, and two of the boys – James and (Ephraim) George – into St Joseph’s Orphanage in Orpington. 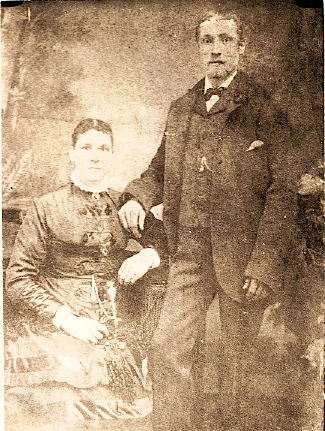 Joseph was brought up by Mary Jane’s sister Annie and her husband Joseph Sullivan. And wee baby Alec was kept by Mary Jane. Such hard times, having to let your children go. In 1901 “Mary Clark Wright”, widow, is living in Deptford with two of her sons: James 16, who is a messenger, and Alexander, 9, a school boy.8 However, in the June quarter of 1901, she marries John Carroll9, and it was as “Grandma Carroll” that my cousin Lally knew her. Tomorrow I’ll tackle the mystery of her birthplace. England, marriage certificate for Ephraim Wright and Mary Jane Freeth; 13 Mar 1882, Lewisham; citing Mar 1882 [quarter] 01d [vol] 1019 [page], General Register Office, Stockport. 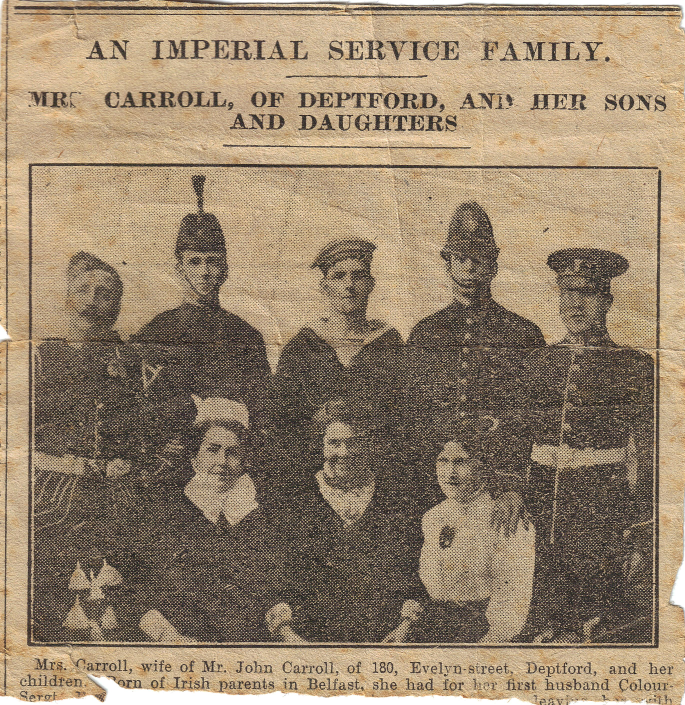 “An Imperial Service Family”, undated clipping from unidentified newspaper; digital image, scanned May 2009 from original held by [NAME AND ADDRESS FOR PRIVATE USE]; inherited from Audrey Dearness, Gisborne, NZ. 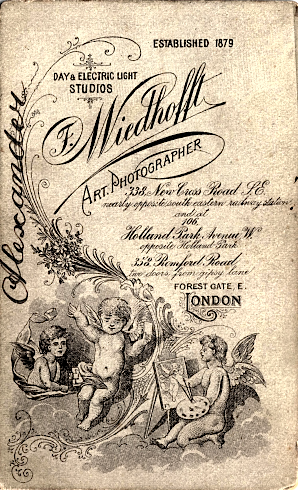 England, birth certificate for Alexander Wright; 27 Jun 1891, St Paul Deptford; digital image, scanned May 2009 from original held by [NAME AND ADDRESS FOR PRIVATE USE]; inherited from Audrey Dearness, Gisborne, NZ, daughter of Alexander. England, death certificate for Ephraim Wright; 26 Nov 1894, Greenwich; citing Dec 1894 [quarter] 01d [vol] 552 [page], General Register Office, Stockport. Alice (Lally) Coppinger (Lomita, California), interviewed Dec 1991; audiotape privately held by author. Coppinger, now deceased, was granddaughter of Mary Jane. “1901 England Census, Mary Clark Wright (age 45) household, St Nicholas Deptford, London,” Ancestry.com, (http://www.ancestry.co.uk/, accessed 2010), citing PRO RG13/526, folio 118, p 60, Greenwich registration district, North Deptford sub-registration district, ED 18, household 300, 31 Mar 1901. “England & Wales, FreeBMD Index: 1837-1983,” database, FreeBMD (http://www.freebmd.org.uk/cgi/search.pl : accessed 2010), marriage entry for John Carroll and Mary Jane Wright; citing Jun 1901 [quarter] Greenwich 1d [vol] 1817 [page]. England, death certificate for Mary Jane Carroll; 12 Feb 1932, Greenwich; citing 1932 Mar [quarter] 01d [vol] 1231 [page], General Register Office, Stockport.